Found 5 file extension associations related to MacOSaiX and 1 file format developed specifically for use with MacOSaiX. 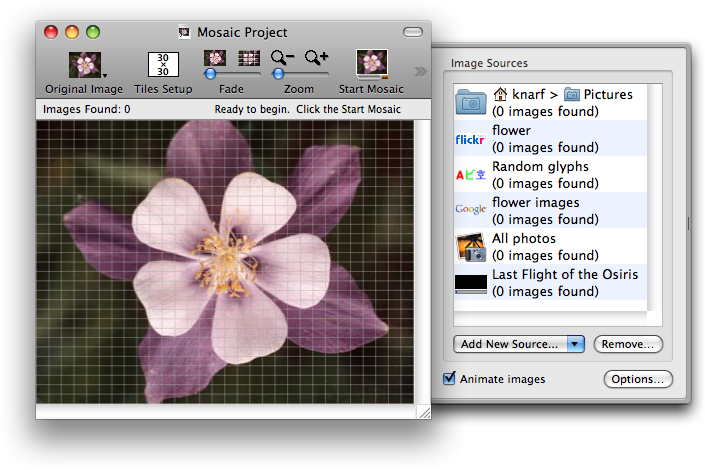 MacOSaiX lets you create a mosaic representation of an image from hundreds or thousands of individual images. The individual images can be found on local disks, created randomly from fonts, found by keyword through Google's or flickr's image database, pulled from iPhoto or pulled from QuickTime movies. You can also choose rectangles, hexagons or puzzle pieces as the shapes of the tiles in the mosaic. MacOSaiX will automatically determine the best location in the mosaic for each image. When you are done you can save the mosaic as a JPG, PNG or TIFF for printing or save it as an interactive web page. The MacOSaiX software seems to be old or discontinued. If you need more information please contact the developers of MacOSaiX (Frank M. Midgley), or check out their product website.